Tomorrow, the LAUSD school board will ratify the 2015-16 budget, along with the district’s Local Control and Accountability Plan (LCAP), increasing an investment in restorative justice to $7.2 million from $4.2 million. This increase is timely, as the work of restorative justice has been immensely impactful in our LAUSD schools at reducing disciplinary incidents that have for years disparately affected students with special needs. This disparity, as well as national trends toward disproportionate numbers of suspensions for African American and Latino students, led LAUSD to reexamine school discipline policies in 2013 with the School Climate Bill of Rights. It also led the Partnership for Los Angeles Schools to formalize an approach to school climate through restorative practices. The Partnership, a nonprofit organization that manages 16 LAUSD schools in Watts, South LA, and Boyle Heights (including Roosevelt High School), embraces Restorative Justice under the umbrella of Restorative Communities — training teachers and other school staff in how to implement restorative practices in their classrooms while supporting Restorative Justice Coordinators in a handful of schools. It is this work that inspired us, as a teacher leader and parent leader in the Partnership network, to establish Parent Restorative Justice Circles at Roosevelt for special needs families. To those unfamiliar with the concept, “Circle” is the safe haven we create in our restorative practices in which we sit in a circle while following guidelines that ensure mutual respect, emotional safety and the strictest of confidence. Our first Circle — “Putting Ourselves in Their Shoes” — had low attendance but was so worthwhile that we vowed to continue: we learned about Specific Learning Disabilities and had the opportunity to experience them through thoughtfully planned activities. It was a small group, but we were moved. We couldn’t believe the degree to which parents were opening up, and we were impressed by how much we all had in common. These were all parents with whom we had chatted on a regular basis. And even though we knew them, these circles gave us insight into their personal challenges and their deep desire to see their children succeed. Word spread quickly and our group grew from four to over 40 parents attending monthly. The stories we hear in Circle are ones that speak to the human experience, based on ensuring that people are respectful, that relationships are honored and repaired when harmed and that we assume responsibility for our actions. For example, one parent said her participation had helped her find peace as she grappled with her daughter’s learning disability. Prior to participating, she had been especially unhappy with the school because she felt her daughter’s special needs were not being addressed. Through restorative practices however, the parent learned to communicate her feelings toward a system she did not understand and came to an agreeable resolution with the school. Given the clashes nationwide this year between police and communities, we are especially proud of the way our Circles have formed a deeper relationship with our school police. Before participating in Circle, police felt their role was limited to patrolling. After participating on a monthly basis, officers are now greeted by parents, teachers and staff, parents ask for advice and frequently invite officers to share a cup of coffee. 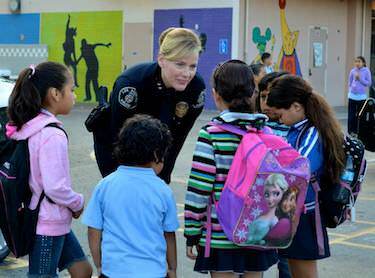 When parents connect with police and school staff, it has a massive impact. Nothing rivals the collective feeling of empathy as when a school police officer and a teacher revealed that they had their own children with special needs. We have made great gains as a member of the Partnership network, and through our Restorative Practices work, suspensions have fallen to the lowest rate in seven years, just under 2 percent. Yet while we would like to say that these Circles have solved our problems, we can’t; we can only say that this is a great start and that our parents and teachers are leading the way. There are over sixty Parent Leaders in the Partnership network who have been trained in leadership and advocacy through the Partnership’s Parent College program in collaboration with LA Voice. And in meetings with school administrators and school board members, parents have advocated for Restorative Justice. In the past year, hundreds of Partnership teachers have been trained in restorative practices; over 20 will serve as Restorative Community Leads at their schools. As the LAUSD board ratifies the LCAP tomorrow, we applaud the members for increasing their investment in restorative justice, and we hope that they will further consider accelerating that investment so that all LAUSD schools can have the same exposure to healing through restorative practices that we have seen at Roosevelt. Araceli Morfín is a Partnership for LA Schools Teacher Leader and Counselor at Roosevelt High School. Raúl Ruíz is a Partnership for LA Schools Parent Leader and Parent at Roosevelt High School.